Irish hares are eighteen times more abundant in areas managed by the Irish Coursing Club (ICC) than at similar sites in the wider countryside a recent study by Queens University Belfast has shown. There are approximately 89 local coursing clubs distributed throughout Ireland and each is associated with a number of discrete localities, known colloquially as hare preserves. 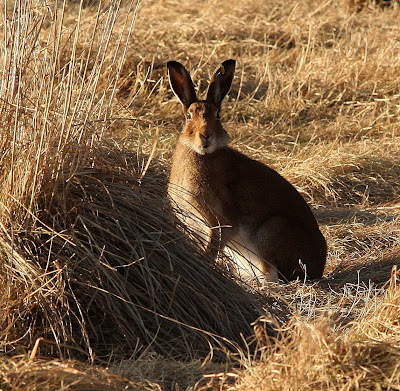 These are managed favourably for hares including predator control, prohibition of other forms of hunting such as shooting and poaching and the maintenance and enhancement of suitable hare habitat. 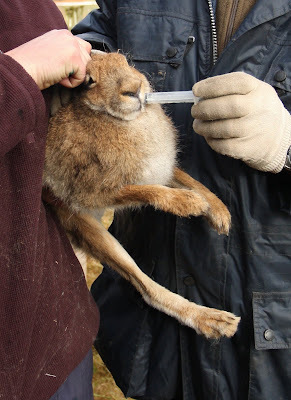 Anti-field sports organisations, in addition to animal welfare objections, dispute the efficacy of ICC hare population management practices claiming that annual harvesting of hares causes local population declines and expiration. The research team, lead by Dr. Neil Reid, Quercus Centre Manager at Queens, indirectly tested the efficacy of management practices by comparing hare numbers within preserves to that in the wider countryside. Dr Reid said: While we cannot rule out the role of habitat, our results suggest that hare numbers are maintained at high levels in ICC preserves either because clubs select areas of high hare density and subsequently have a negligible effect on numbers, or that active population management positively increases hare abundance. The research, published in the peer-reviewed international journal Acta Theriologica, suggests that field sports such as shooting, hunting and hare coursing promote the multifunctional use of farmland in which wildlife provides a resource for non-agricultural activities supporting sustainable development. Also, field sports may offer financial and recreational incentives to farmers and private landowners who are frequently willing to accept conservation costs over a wider area than Government can afford to subsidize. Co-author Professor Ian Montgomery, Head of the School of Biological Sciences at Queens said: The Irish Hare is one of the highest priority species for conservation action in Ireland and without concessions for its role in conservation, any change in the legal status of hare coursing under animal welfare grounds, may necessitate an increase in Government subsidies for conservation on private land together with a strengthened capacity for legislative enforcement. This latest research follows on from a previous study published by the same group in the journal Animal Welfare during 2007, which showed that survival of hares at coursing events significantly improved with the introduction of compulsory muzzling of greyhounds in 1993, while improved levels of captive animal husbandry reduced mortality yet further. It is estimated that about four per cent of the 6,000 or so hares netted by the ICC each year are killed with the rest being released back into the wild. It is now a known FACT that Coursing is banned in Northern Ireland............and as a direct result of this, a independent survey has found the Hare is in decline in those areas. So much so that Northern Ireland has applied to the south for help to restock its areas! Hare coursing is a sport that does not set out to kill the Hare...........it conserves it! Where there is a Coursing Club , there are club members who look after the hare and its habitat. Landowners and club members go out of there way to keep poachers away............Poachers are people that are never mentioned by the antis , but they are a real and constant threat to the hare. Poachers go out with the intention to KILL the hare.............and they account for vast numbers. Another big threat are Mink and Fox............a family of foxes will account for on average 30 hares a year!! Coursing clubs keep fox and mink populations in check. and that does not take into account all the other creatures and birds the mink like to kill for fun......plus my chickens!! Once a hare is captured for coursing the first thing the club will do before the hare is released into its pen is to give the hare a worm dose............make no mistake.............worms are a real and constant threat to a hares life. The Irish Hare may lose its protection in Northern Ireland after the Stormont Environment Committee decided against putting it in a protection schedule yesterday (Thurs 25th March). The Irish Coursing Club and the Irish Countryside Alliance attended before the Northern Ireland Environment Committee on February 18, to outline to the Committee the positive impact coursing clubs play in maintaining a healthy hare population. They were joined by Professor Ian Montgomery of Queens University. 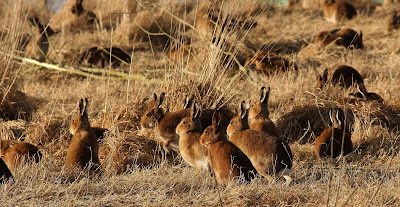 The most recent study by Quercus was presented to the Committee, whereby hare population densities are 18 times greater in areas where coursing takes place, as were the most recent experiences in the South. The ICC detailed the licensing system and conditions to that licence in vogue in the South. Members debated its future as part of the Wildlife and Natural Environment Bill. Unless its special protection order is renewed in September, the hare could be taken for coursing or killed. The NI Assembly committee decided not to place it in the safety of Schedule 5 in the new wildlife Bill. Schedule 5 provides total protection for any species listed under it. The committee heard that although the hares numbers in Northern Ireland had dropped alarmingly, they have since recovered but are still at a relatively low level. Keeping the order in place means the species has to be monitored and counted annually and the cost of that can be about Stg 40,000 a year. The BBC understand that the temporary order may not be renewed in September, leaving the Irish hare to its fate. If protection is removed in the Autumn it could allow hare coursing to start again. Although legal in the Republic of Ireland, coursing was stopped in NI in 2003 when the protection order began. One glimmer of good news for the hare is that they will not be caught in snares. The Environment Committee voted to ban the use of snares in Northern Ireland. It had considered allowing them to continue under strict licence but decided that a total ban was the best way forward. The Wildlife and Natural Environment Bill will go before the Northern Ireland Assembly later in the year for final approval.